India Mike » India Travel » Cities in India » Kolkata (Calcutta) » What an outsider should expect in Kolkata during Pujo? What an outsider should expect in Kolkata during Pujo? As everyone know, Durga Puja is one of the biggest, grandest festivals of West Bengal in general and Kolkata in particular. It is celebrated with great enthusiasm and grandeur. What is position of local transportation and local eateries... and their availabilities? So?. I think all Indians are fond of all celebrations.? Alright, I possibly could perhaps chide you for being 'offensive' to our religious beliefs and festivals, but I'll tell you rather the reason why it's so obvious that all of us are crazy about the Durga Puja - Simply because it's Awesome!!! I am not a very religious individual. Yet I love Durga Puja from the core of my heart. 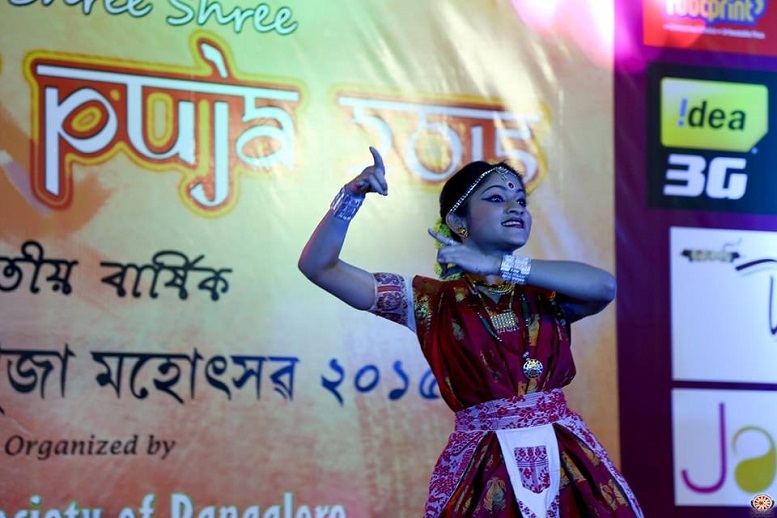 Since my years as a child, I have involved Durga Puja with the painting competitions, the quiz shows and the dhunuchi dance I used to participate in. Not to mention, getting excited about the brand new outfits every year. This celebration rocks for youngsters like me! One of the cultural shows that are performed during the Puja. We Bengali people are foodies. It is a obvious fact. And this special occasion gives Bengalis the best chance to explore their test buds. People around India celebrate Navaratri by fasting while Bengalis absolutely have the time of their lives, feeding on Cutlet, Chicken Roll and Ice cream on road side eateries. Where we enjoy delicious Mutton and fish curry cooked by our mother/wife with misti (sweets) at home . 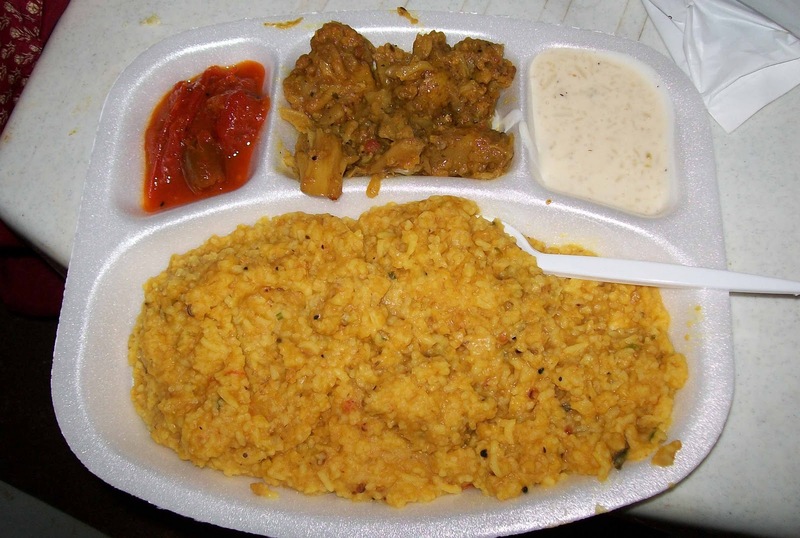 In all probability among the best things about Durga Puja is the "Bhog" that they serve. It is made up of Khichdi, sabzi, papad, and tomato chutney usually. . Yum! 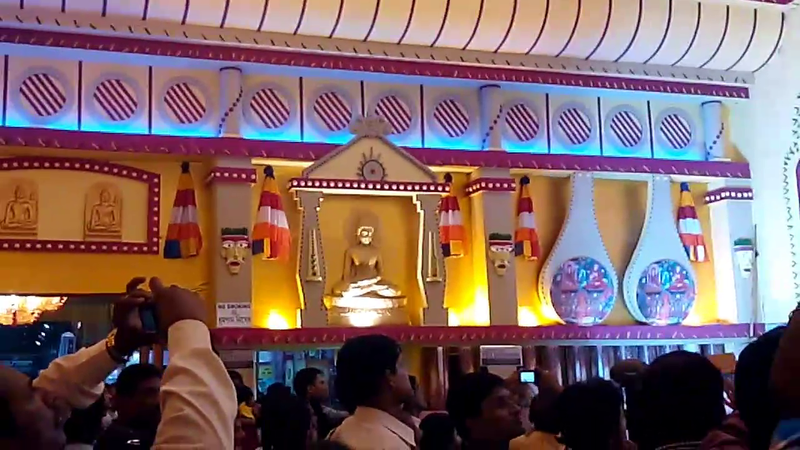 Now, not surprisingly it's time for the Puja Pandal hopping. 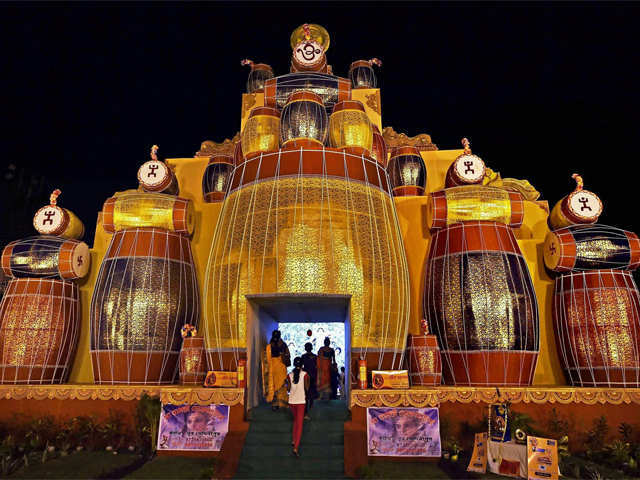 You will find art with beauty and elegance combiningly present in the pandal and the pratima decoration and it amazes me everytime when I think that this vast work of art is only for a few days. The story of how Ma Durga defeated Mahishasur is very thrilling and people love it when the first announcement of Puja happens through the air in "Mahalaya" by describing this story. The sheer hard work and intricacy in each of them, is incredible. Actually they are so vast in design and decoration that you cannot capture in one frame. A lot of people get job for this huge work. The main moto behind any festival celebration is to create a collective cultural identity and Durga Puja is no exception. Members of the family stay together and bonding continues. 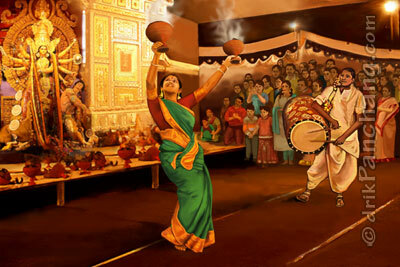 "Dhunuchi" dance that is performed to the "Dhak's" beats and that is the most enjoyable part. You will want to join it just looking at it! It is a ceremony of "Dashmi", known as "Shidur khela" (playing with sindur) where married women apply sindur to each other's faces dressed in the conventional Bengali apparel. And lastly me posing in front of a pandal. Thank you for input, @Illuminated! But, had never intended to hurt anyone's sentiments. 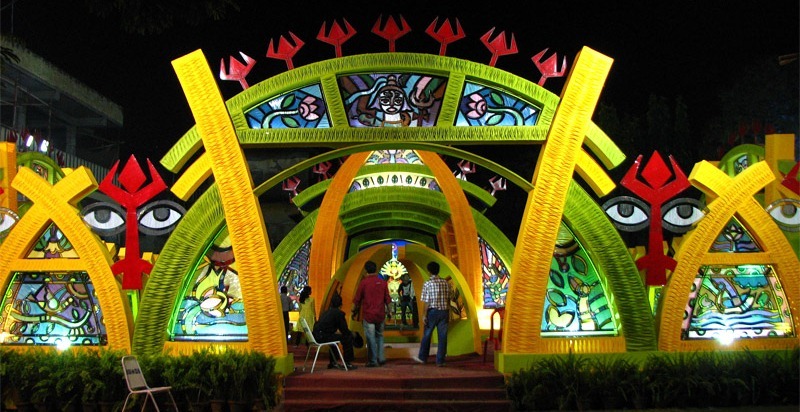 Durja Pujo in Kolkata and West Bengal is an experience altogether. Being born in Bengal and staying there till date, I can't explain how it is. But thanks to Illuminated, who did a great job in explaining. Generally Bus runs almost whole night in those days. Metro runs late night. 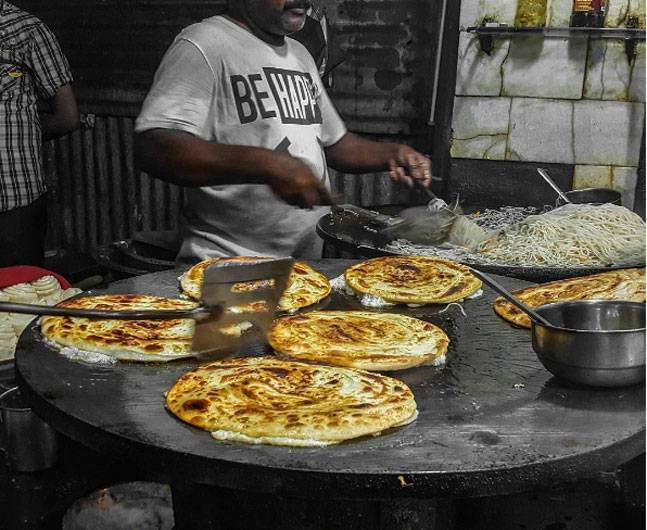 local eateries are available everywhere. You will get lots of established restaurants and make shift ones as well. Now, it's up to you where to eat!! Should be available. Where do you want to stay? Near to Airport/Rail Station/Central Kolkata etc. ?